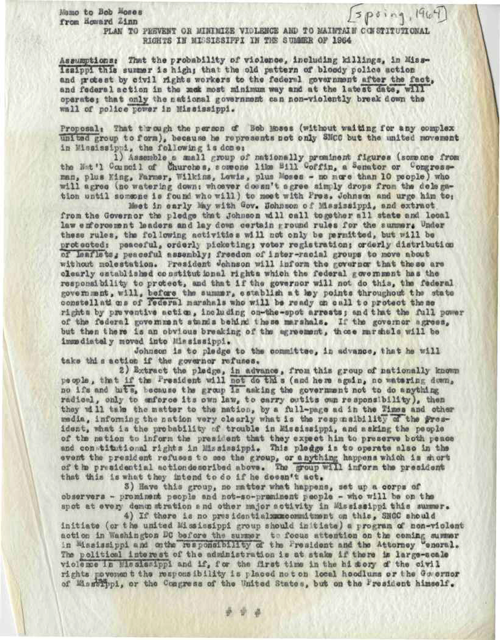 This 1964 memo from Howard Zinn to Bob Moses (a leader of the Student Nonviolent Coordinating Committee) outlined a plan to minimize violence in Mississippi for the upcoming Freedom Summer, when hundreds of volunteers would be arriving to help African-American residents register to vote, establish a new political party, and learn about history and politics in the newly-formed Freedom Schools. The memo also addressed ways to pressure President Johnson to enforce constitutional rights of citizens exercising their right to vote (“the group is asking the government not to do anything radical, only to enforce its own law”). 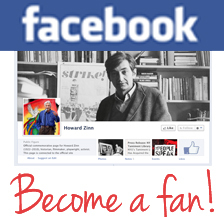 The memo is from the Freedom Summer Digital Archives, a vast collection of more than 30,000 pages of official records, personal papers, racist propaganda, diaries, images, and newsletters, including Howard Zinn’s papers on SNCC. Assumptions: That the probability of violence, including killings, in Mississippi this summer is high; that the old pattern of bloody police action and protest by civil rights workers to the federal government after the fact, and federal action in the most minimum way and at the latest date, will operate; that only the national government can non-violently break down the wall of police power in Mississippi. Meet in early May with Gov. Johnson of Mississippi, and extract, from the Governor the pledge that Johnson will call together all state and local law enforcement leaders and lay down certain ground rules for the summer. Under these rules, the following activities will not only be permitted, but will be protected: peaceful, orderly picketing; voter registration; orderly distribution of leaflets; peaceful assembly; freedom of inter-racial groups to move about without molestation. President Johnson will inform the governor that these are clearly established constitutional rights which the federal government has the responsibility to protect, and that if the governor will not do this, the federal government, will, before the summer, establish at key points throughout the state constellations of federal marshals who will be ready on call to protect these rights by preventive action, including on-the-spot arrests; and that the full power of the federal government stands behind these marshals. If the governor agrees, but then there is an obvious breaking of the agreement, those marshals will be immediately moved into Mississippi. Johnson is to pledge to the committee, in advance, that he will take this action if the governor refuses. 2) Extract the pledge, in advance, from this group of nationally known people, that if the President will not do this (and here again, no watering down, no ifs and buts, because the group is asking the government not to do anything radical, only to enforce its own law, to carry out its own responsibility), then they will take the matter to the nation, by a full-page ad in the Times and other media, informing the nation very clearly what is the responsibility of the President, what is the probability of trouble in Mississippi, and asking the people of the nation to inform the president that they expect him to preserve both peace and constitutional rights in Mississippi. This pledge is to operate also in the event the president refuses to see the group, or anything happens which is short of the presidential action described above. The group will inform the president that this is what they intend to do if he doesn’t act. 3) Have this group, no matter what happens, set up a corps of observers — prominent people and not-so-prominent people — who will be on the spot at every demonstration and other major activity in Mississippi this summer. 4) If there is no presidential commitment on this, SNCC should initiate (or the united Mississippi group should initiate) a program of non-violent action in Washington DC before the summer to focus attention on the coming summer in Mississippi and on the responsibility of the President and the Attorney General. The political interest of the administration is at stake if there is large-scale violence in Mississippi and if, for the first time in the history of the civil rights movement the responsibility is placed not on local hoodlums or the Governor of Mississippi, or the Congress of the United States, but on the President himself. From the Freedom Summer Digital Collection at Wisconsin Historical Society.